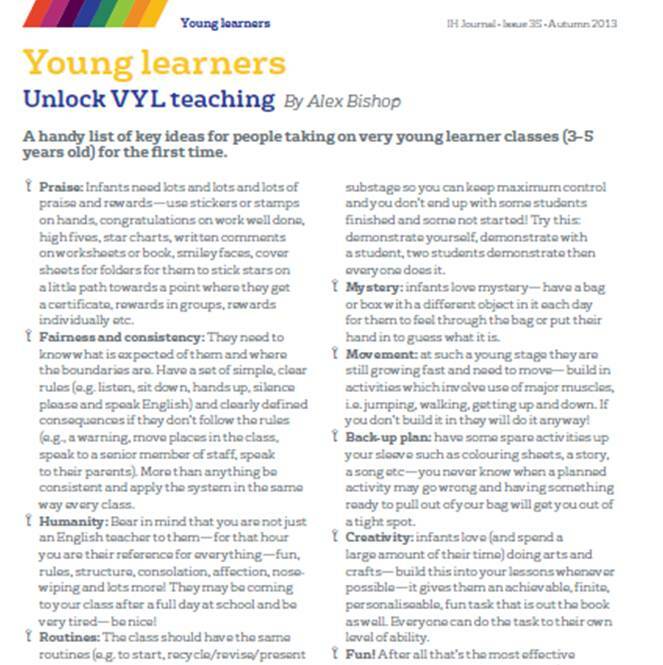 A handy list of key ideas for people taking on very young learner classes (3-5 yrs old) for the first time. Praise: Infants need lots and lots and lots of praise and rewards – use stickers or stamps on hands, congratulations on work well done, high fives, star charts, written comments on worksheets or book, smiley faces, cover sheets for folders for them to stick stars on a little path towards a point where they get a certificate, rewards in groups, rewards individually etc. Fairness and consistency: They need to know what is expected of them and where the boundaries are. Have a set of simple, clear rules (e.g. listen, sit down, hands up, silence please and speak English) and clearly defined consequences if they don’t follow the rules (e.g., a warning, move places in the class, speak to a senior member of staff, speak to their parents). More than anything be consistent and apply the system in the same way every class. Humanity: Bear in mind that you are not just an English teacher to them – for that hour you are their reference for everything – fun, rules, structure, consolation, affection, nose-wiping and lots more! They may be coming to your class after a full day at school and be very tired – be nice! Routines: The class should have the same routines (e.g. to start, recycle/revise/present language, work in a circle on the floor or sitting at the table, tidy up and finish). What you change is the content of each stage. Clear and simple: rather than instructions have an example or demonstrate activities, with a very clear ‘route’ to the end of the stage. Keep them in lockstep for each substage so you can keep maximum control and you don’t end up with some students finished and some not started! Try this: demonstrate yourself, demonstrate with a student, 2 students demonstrate then everyone does it. Mystery: infants love mystery – have a bag or box with a different object in it each day for them to feel through the bag or put their hand in to guess what it is. Movement: at such a young stage they are still growing fast and need to move – build in activities which involve use of major muscles, i.e. jumping, walking, getting up and down. If you don’t build it in they will do it anyway! Back-up plan: have some spare activities up your sleeve such as colouring sheets, a story, a song etc – you never know when a planned activity may go wrong and having something ready to pull out of your bag will get you out of a tight spot. Creativity: infants love (and spend a large amount of their time) doing arts and crafts – build this into your lessons whenever possible – it gives them an achievable, finite, personaliseable, fun task that is out the book as well. Everyone can do the task to their own level of ability. Fun! After all that’s the most effective way for them to learn – play games (with flashcards, soft toys, plastic fruit, plastic animals), sing songs (any one, it doesn’t have to be some awful EFL coursebook song! 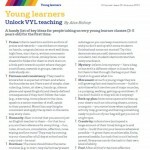 ), dance, read stories in silly voices, and remember if they are not having fun they will not learn half as effectively! 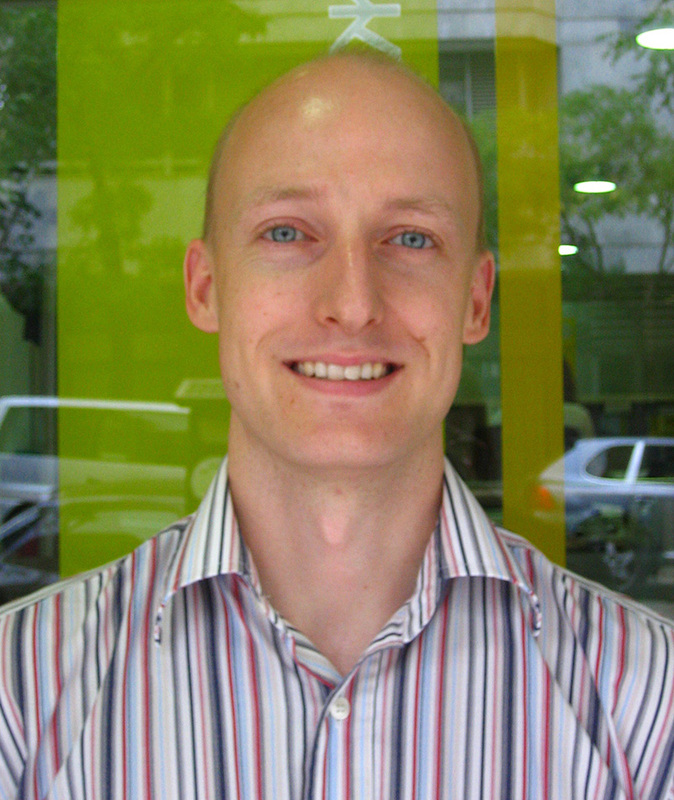 Alex has worked in ELT since 1999. He has worked for IH Madrid since 2000 in various roles – as an ADOS, DOS YL, then since 2010 as Director of Human Resources, with responsibility for recruitment, timetabling and professional development in the company. He is also a CELTA tutor and trains teachers as part of the in house professional development programme. He likes teaching VYL and beginner level adults. Back to Issue 35: Autumn 2013, Uncategorized of the IH Journal of Education and Development.